With an abundance of delicious Maine-made ice cream and locally-sourced milk, many Maine restaurants have creamy milkshakes on the menu. Choose from adult-only milkshakes to classic vanilla ice cream shakes to more creative and vegan-friendly options across the state. You’ll find plenty of creative and tasty milkshakes at New Orleans-style restaurant, Po’ Boys & Pickles. From honey ginger to bananas foster to peanut butter chocolate chip cookie, Po’ Boys & Pickles can turn any sweet desert into liquid form in a glass. Every sauce used to make these unique milkshakes are made in house. Houlton Farms Dairy is an expert when it comes to dairy products. With several seasonal dairy bars in Houlton, Presque Isle and Caribou, Houlton Farms Dairy Bar serves up creamy and flavorful ice cream, lemon sherbet and milkshakes. Don’t forget to order the “Awful, Awful Milkshake” that comes with an extra scoop of ice cream on top. Wahl’s Dairy Port is known throughout the Bucksport region for their extensive menu of both hard serve and soft serve ice cream flavors. With over 30 flavors of Gifford’s Ice Cream and a calendar of rotating soft serve flavors, like peanut butter, peach, and Kahlua, you can create also any flavor of milkshake. Witch Spring Hill Ice Cream in West Bath is a favorite amongst the midcoast communities. The parking lot is almost full during most of the summer so come early and enjoy one of the many Round Top flavors or tasty milkshake suggestions. Shain’s of Maine Ice Cream is one of the most popular ice cream companies in Maine with just about every flavor possible. 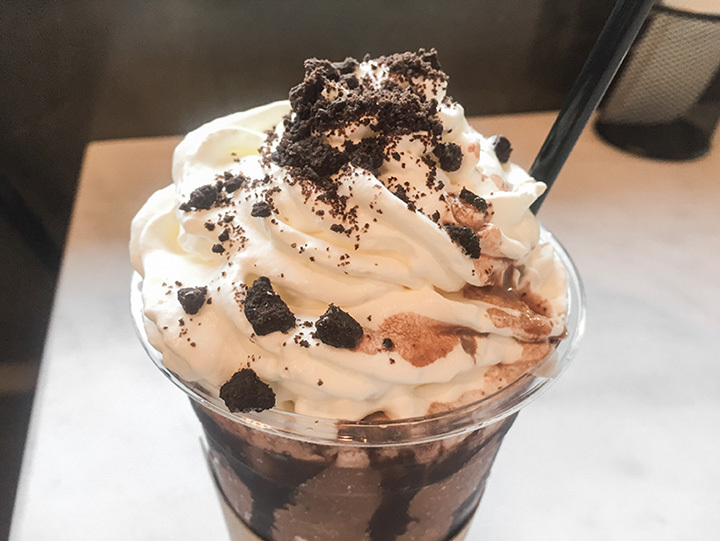 In their Sanford Milk Parlor, you can order from a menu of over 50 flavors of ice cream, frozen yogurt and sherbet to create the perfect frappe or milkshake. Silly’s is a longtime Portland favorite with an extensive menu of food ranging from vegan to meat to boozy milkshakes. The milkshake is eclectic with creative names that taste just as good. If you’re not a fan of milk, you can choose from dairy free options like soy or rice milk. Take a blast to the past with Nicky’s Crusin’ Diner in Bangor. This 50s-theme diner serves up traditional diner food and even has a drive-in entrance. The milkshakes are tasty and affordable here. Dysart’s Coldbrook Road Restaurant in Hermon is a local favorite with a great menu full of comfort food and traditional Maine dishes. Dysart’s, true to their truck stop history, serves up large portions, including their milkshakes. Choose from a range of flavors. With several locations across the state of Maine, Governor’s Restaurant & Bakery is a longtime Maine favorite first started in 1959. Their milkshakes are only $4 and come with a cherry on top. Choose from classic flavors like vanilla, chocolate, coffee, and strawberry.